Adult primary liver cancer is a disease in which malignant (cancer) cells form in the tissues of the liver. To filter harmful substances from the blood so they can be passed from the body in stools and urine. To make bile to help digest fat that comes from food. To store glycogen (sugar), which the body uses for energy. There are two types of adult primary liver cancer. The most common type of adult primary liver cancer is hepatocellular carcinoma. This type of liver cancer is the third leading cause of cancer-related deaths worldwide. This summary is about the treatment of primary liver cancer (cancer that begins in the liver). Treatment of cancer that begins in other parts of the body and spreads to the liver is not covered in this summary. Having hepatitis or cirrhosis can affect the risk of adult primary liver cancer. Having hepatitis B or hepatitis C. Having both hepatitis B and hepatitis C increases the risk even more. drinking large amounts of alcohol for many years or being an alcoholic. Having metabolic syndrome, a set of conditions that occur together, including extra fat around the abdomen, high blood sugar, high blood pressure, high levels of triglycerides and low levels of high-density lipoproteins in the blood. Having liver injury that is long-lasting, especially if it leads to cirrhosis. 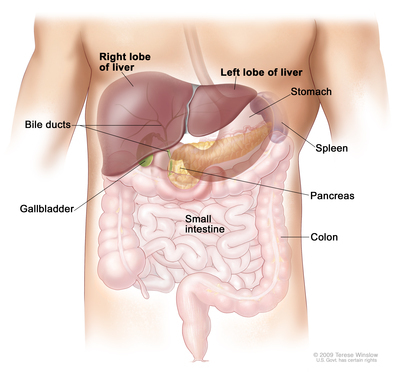 Signs and symptoms of adult primary liver cancer include a lump or pain on the right side. A hard lump on the right side just below the rib cage. Pain near the right shoulder blade or in the back. Loss of appetite or feelings of fullness after eating a small meal. Pale, chalky bowel movements and dark urine. Tests that examine the liver and the blood are used to detect (find) and diagnose adult primary liver cancer. Serum tumor marker test: A procedure in which a sample of blood is examined to measure the amounts of certain substances released into the blood by organs, tissues, or tumor cells in the body. Certain substances are linked to specific types of cancer when found in increased levels in the blood. These are called tumor markers. An increased level of alpha-fetoprotein (AFP) in the blood may be a sign of liver cancer. Other cancers and certain noncancerous conditions, including cirrhosis and hepatitis, may also increase AFP levels. Sometimes the AFP level is normal even when there is liver cancer. Liver function tests: A procedure in which a blood sample is checked to measure the amounts of certain substances released into the blood by the liver. A higher than normal amount of a substance can be a sign of liver cancer. CT scan (CAT scan): A procedure that makes a series of detailed pictures of areas inside the body, such as the abdomen, taken from different angles. The pictures are made by a computer linked to an x-ray machine. A dye may be injected into a vein or swallowed to help the organs or tissues show up more clearly. This procedure is also called computed tomography, computerized tomography, or computerized axial tomography. Images may be taken at three different times after the dye is injected, to get the best picture of abnormal areas in the liver. This is called triple-phase CT. A spiral or helical CT scan makes a series of very detailed pictures of areas inside the body using an x-ray machine that scans the body in a spiral path. MRI (magnetic resonance imaging): A procedure that uses a magnet, radio waves, and a computer to make a series of detailed pictures of areas inside the body, such as the liver. This procedure is also called nuclear magnetic resonance imaging (NMRI). To create detailed pictures of blood vessels in and near the liver, dye is injected into a vein. This procedure is called MRA (magnetic resonance angiography). Images may be taken at three different times after the dye is injected, to get the best picture of abnormal areas in the liver. This is called triple-phase MRI. Fine-needle aspiration biopsy: The removal of cells, tissue or fluid using a thin needle. Core needle biopsy: The removal of cells or tissue using a slightly wider needle. Laparoscopy: A surgical procedure to look at the organs inside the abdomen to check for signs of disease. Small incisions (cuts) are made in the wall of the abdomen and a laparoscope (a thin, lighted tube) is inserted into one of the incisions. Another instrument is inserted through the same or another incision to remove the tissue samples. A biopsy is not always needed to diagnose adult primary liver cancer. The stage of the cancer (the size of the tumor, whether it affects part or all of the liver, or has spread to other places in the body). How well the liver is working. The patient’s general health, including whether there is cirrhosis of the liver.